WILMINGTON, N.C. – Cape Fear Museum has been awarded a $9,975 grant from South East Area Health Education Center (SEAHEC) Legacy Fund and New Hanover Regional Medical Center Foundation. Funds will be used to establish a Health Matters program, a fifth grade field trip focusing on health and human body systems. Education staff worked with a committee of volunteers from the education and medical fields to develop a 90-minute program that meets NC Essential Science Standards. During the three-part field trip, students will experience Grossology and You, a full-dome digital video exploring the inner workings of the human immune, respiratory and digestive systems. Fifth graders will also participate in a heart muscle fitness challenge, examine anatomical models and learn the flow of the blood through the human body using a large-scale heart model. Lastly, they will discover how mechanical devices relate to heart function, use heart rate monitors to measure pulse and find out why physical activity is important for good heart health. South East Area Health Education Center is a non-profit organization created in 1972 in an effort to bring medical care services into rural communities. Through a national led effort, North Carolina was one of the first states to establish Area Health Education Centers. These centers provide the same quality of training, education and resources traditionally only available to healthcare professionals located near medical schools and major universities. Today, ten centers serve the 100 counties of the state. While North Carolina’s central office is in Chapel Hill, SEAHEC’s office is in Wilmington. SEAHEC is partnered with New Hanover Regional Medical Center (NHRMC) and governed by the NHRMC board of directors. Cape Fear Museum of History and Science is a department of New Hanover County located at 814 Market Street. The Museum is open Monday -Saturday, 9 a.m. to 5 p.m.; Sunday 1 to 5 p.m. General admission is free to all museum members. For non-members, general admission is $8 for adults; $7 for seniors, students and military with valid ID; $5 for children 6-17; and free for children 5 and under. New Hanover County residents’ free day is the first Sunday of each month. More information: www.capefearmuseum.com. 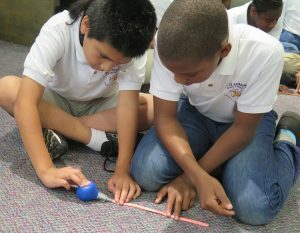 Photo: Using a bulb syringe and a thin balloon, Snipes Academy students learn about the heart and blood vessels.